The development of sports in Nepal is not an old phenomenon. It was only after the establishment of Nepal Amateur Athletics Association (NAAA) in 1954, that Nepal put a foothold in world sports. The Nepali Army has been the main contributor to the development of sports in Nepal. In fact, the sporting history of Nepal reads like the sporting history of the NA. The NA has been the key organization to produce world class athletes to represent Nepal in various international arenas. With the aim of selecting athletes to represent Nepal in the international arena in order to establish a presence in world sports, the NAAA launched the first track and field meet in 1951 in which the Nepali Army achieved a grand success. Since then the Nepali Army has never turned back and has produced large numbers of world class athletes to represent Nepal. Gajraj Joshi of the Nepali Army was the first Nepalese athlete to participate in an international event. In 1951, he took part in Asian Games at New Delhi. Similarly the first two Nepalese Olympians, Ganga Bahadur Thapa and Bhupendra Silwal, who participated in the 18th Olympic games held in Japan in 1964, were both from the Nepali Army. The first international medal for Nepal was won by a Nepali Army athlete, Jeet Bahadur KC. Listed below are some of the important contributions that the Nepali Army has made in the the various fields of sports. No description of the Nepali Army in sports can be completed without mentioning of the Tribhuvan Club. The Tribhuvan Club is an all Army sports club that has been participating in various sports very successfully. The Nepali Army has not only developed world class athletes but after establishment of the Tribhuvan Club, it has also produced large number of national players to represent the country in sports like athletics, football, basketball, volleyball and Boxing. 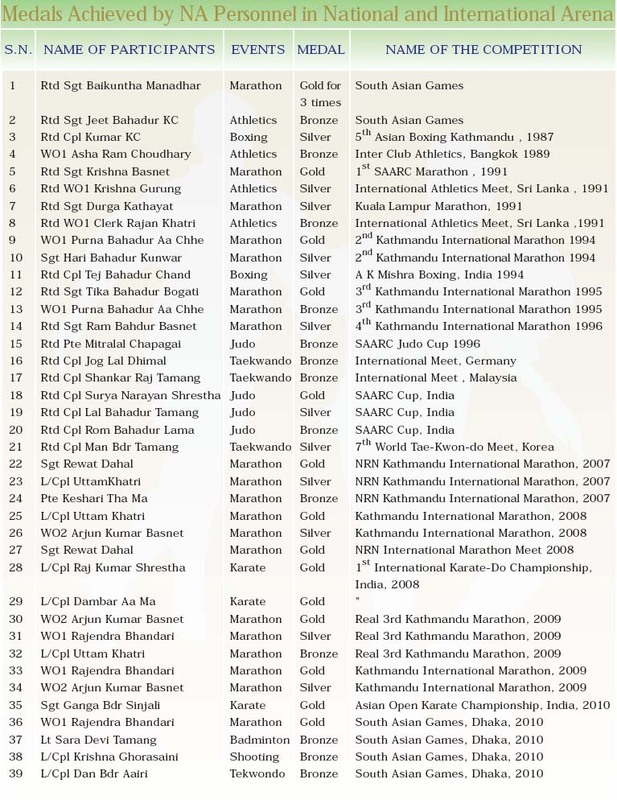 All these achievements demonstrate the Nepali Army's commitment towards Nepalese sports.